The municipality Amlach is located at the foot of the Lienz Dolomites along the Drau riverbank. “Amblach”, as the village used to be called, has been mentioned for the first time in 1169 AD, and became seat of the court for this area in the 13th century. The name Amlach probably derives from the Slovene term “Jamljani” that, literally translated, means “inhabitant of a pothole”. In 1939 the municipality was consolidated with the neighbouring Tristach, but became autonomous again in 1955. Amlach and the hamlet Ulrichsbichl form the municipal territory, the highest elevation of which is the 2,718 m high Spitzkofel mountain. The lime tree on the emblem of the municipality is the symbol of Amlach. 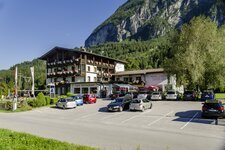 The little village is located at the southern edge of the basin of Lienz and is especially popular with those who seek relaxation. The surroundings offer several possibilities as far as hiking is concerned, and several MTB-trails snake their way across the beautiful Lienz Dolomites. Only 2 km from the village you come across Lake Tristach, extending at 821 m asl. Its waters, ideal for swimming, in summer reach a temperature of up to 24 degree C, and its lido is one of the most popular destinations in summertime. Only a stone’s throw from the village, there is also a real natural jewel, which is the Galitzenklamm gorge with its water educational trail. From the impressive stone bridge you can see the Galitzenbach river with the waterfalls, while the educational trail provides interesting information on the history of the canyon as well as flora and fauna of the area. In Amlach itself, there are several sacred buildings that are worth to be visited, such as the St. Ottilia church in the centre of the village. It’s been a long time that people suffering from eye, throat and ear complaints come to this place in order to appeal to St. Apollonia’s, St. Lucia’s and St. Ottilia’s help. A former construction, that has already been established in the 13th century, was dedicated to St. Gertraud. Also the St. Ulrich chapel at the Ulrichsbichl hill is worth to be visited! Originally wooden-built, it was replaced in the 18th century by a stone construction. In the interior there is an altar with a miraculous image of Jesus with a crown of thorns, the Blessed Mother Mary and John the Baptist. Our recommendation: since 2004 in the Galitzenklamm gorge there is a stone ball mill, in which various stone balls are formed by the power of water only!